A Hawick pub’s bid to allow teenagers in without adult accompaniment faces partial opposition from the police. Scottish Borders Council’s licensing board will tomorrow consider varying the premises licence for the Bourtree, part of the JD Wetherspoon chain. At present, children and young people are only allowed access to the Bourtree Place watering hole if they are accompanied by a responsible adult over the age of 18 intending to consume a meal. The current rule is that children must vacate the premises by 10pm on Sundays to Thursdays and by 8pm on Fridays and Saturday. However, a new application, submitted by premises licence holder Kristofor Mooney, asks that teenagers aged 16 and 17 be allowed access to the pub without adult accompaniement for the purpose of having a meal. 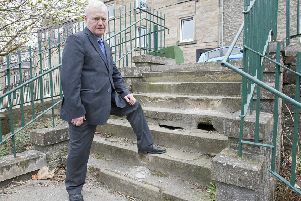 It also asks that they be permitted to remain in the premises, built as Hawick Conservative Club in 1897 and later used as a snooker hall, until 10pm. Under the terms of the application, they would have to vacate the bar area after ordering a meal and non-alcoholic drink. Police are concerned about the move, however. Police Scotland Chief Constable Phil Gormley does not oppose the bid to allow young persons to eat unaccompanied, but he recommends that the application should be altered to ensure children and young people are not given access to the premises after 8pm on any day except Friday and after 9pm on Friday itself, so “children and young people are not exposed to violence, drunkenness and inappropriate activity”. He says: “The premises, while being well managed, does have incidents of violence and drunkenness. “These incidents vary in time and day and have occurred during the afternoon, evening and later at night. “Given the recent change in legislation to include young people in the licensing objectives of protecting children and young people from harm, it is requested the board consider amending this application. “It is accepted that food sales are, in the main, the purpose for many attending the premises. “However, there is a change in the nature of the premises from food-driven to be alcohol-driven, which in the past has been accepted as being at 8pm. “It may be more appropriate to maintain this terminal hour for children and young people on Saturdays and allow a later terminal hour of 9pm on Fridays. The Bourtree was opened by Hertfordshire-based JD Wetherspoon six years ago. It is one of three pubs the chain runs in the Borders, the others being in Galashiels and Peebles. There are no objections to the plan from the board’s licensing officer, Ian Tunnah. Premises licence holder Mr Mooney was unavailable for comment today.